At this point, most associations have accepted the reality that membership, as traditionally structured, is changing. The question that comes up again and again is - do we have a truly worthwhile value proposition? Or perhaps the statement - if we only had the right value proposition then more members would renew and a greater number of our customers would become members. 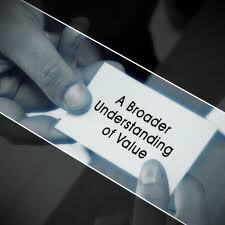 Here is my problem with this approach - have you ever heard a member use the words 'value proposition'? Even though the term may connote the same meaning as what we are trying to achieve, if we are truly trying to be more member-centric, we should build the value of membership on what is at the heart of the association premise as a whole - because of a professional's membership in their association, they will know more, progress further faster, earn more money over their lifetime, and have a stronger network of colleagues and contacts. In short - if someone is a member of their association, they will be a better professional and have a better life. As we shift from a long list of benefits to focus on the impact-value of truly useful offerings and opportunities, we also need to transform the theme of the narrative we are telling. - Is a central member benefit a private social network? We need to share stories of those who were able to solve problems and find opportunities using that network. - Do members get exclusive job offerings? If so, we should share the testimonials of those that have found their next step because of that opportunity. - Can young professional members participate in a mentoring program with Fellows/experienced mentors? We should turn this benefit into an invitation. - Are there volunteer positions that are exclusively for members? Let's tell the 'so what' - have those who have held the position talk about what skills they learned or contacts they made by serving that they then used to advance at work. If we create benefit opportunities that customers can easily weave into their own story of success, then the value of membership is both personal and obvious. The impact of the association transcends the benefits it offers and becomes a platform for ongoing professional growth and success. Smarter, better, happier professionals - the formula for that result should be our value proposition. I agree completely that this is a shift that associations need to make. And I think that each of the opportunities that you describe can be fine-tuned by understanding the needs of the members that we serve. Some professions may have more emphasis on networking/finding jobs, others on the technical aspects required to succeed in the profession, others on particular business issues that come up commonly in the profession. Understanding the challenges that your members face, and building opportunities around those is the path to success.